The art of animation goes to infinity and beyond as Walt Disney Pictures and Pixar Animation Studios, a Northern California-based pioneer in computer graphics, join creative forces on the infinitely entertaining Toy Story, the first full-length animated feature to be created entirely by artists using computer tools and technology. Four years in the making, this delightfully irreverent new comedy-adventure combines an imaginative story and great characters with the visual excitement of 3-D computer-generated animation. Conceived and directed by John Lasseter, a former Disney animator whose innovative work with Pixar includes the 1989 Oscar-winning short, Tin Toy, this film represents a major milestone in animated moviemaking with its groundbreaking graphic style adding to the believability of a world where toys have a life of their own. With a cast of top vocal talent headed by Tom Hanks and Tim Allen plus three entertaining new songs and an inspired score by renowned composer/performer Randy Newman, the fantasy takes flight and provides extraordinary delights for moviegoers of all ages. Download Toy Story in Digital HD from the iTunes store. 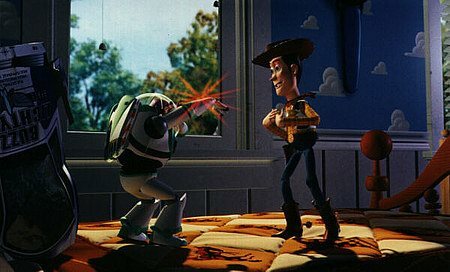 Toy Story images are © Walt Disney Pictures. All Rights Reserved. 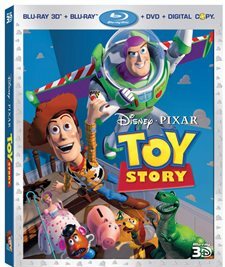 On November 1, Disney released the original Toy Story on 3D Blu-ray combo pack. There is something about this release that I haven't noticed about most other 3D releases and that is: This movie looks better in 3D than it does on regular Blu-ray. 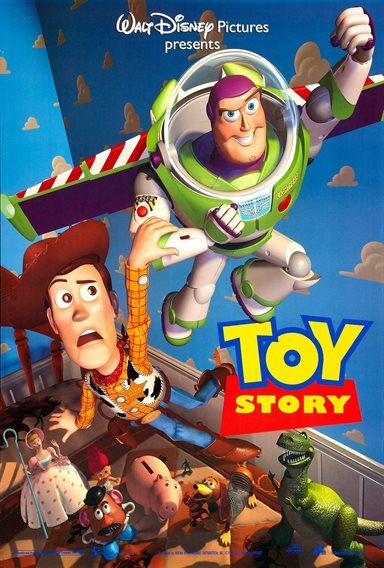 While Toy Story 3 was being made, the team at Pixar re-rendered the first and second movies in the trilogy in 3D and released them in theaters for a limited run in the fall preceding the theatrical release of Toy Story 3. I had the opportunity to see it during the run but the home entertainment release really outshines the theatrical version. The colors and brighter, the images just as sharp and the increased depth of field amazing. If there was ever a movie that should be seen in 3D over any other format, this one would be it. As expected as well, the audio has been improved from the original release with more 3-D effects to go with the rendering. Toy Story is the story of two toys. The first is Woody, a cowboy from Woody's Roundup, who is the favorite toy of Andy. The movie opens up with Andy playing make-believe with his toys, and Woody is the hero. Shortly thereafter we find out not only do the toys come to life when no human is around, but that it is Andy's birthday, and that means….new toys. Every year at the birthday parties the toys are worried that a new toy will come along to replace them. In previous years it hadn't happened. But not this time. Andy rushes into his room, pushes Woody off his bed and puts his new toy in Woody's former place. This new toy (Buzz Lightyear) isn't a cowboy, he's a Space Ranger – an intergalactic police officer. To make matters worse, this toy actually believes he is a real Space Ranger, and not just a toy. After a short while Buzz gets the other toys to like him to Woody's displeasure. 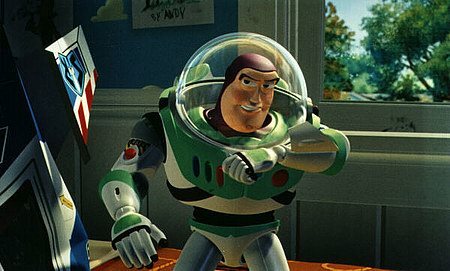 Woody then tries to knock Buzz behind a dresser to hide him from Andy, but knocks him out of an open window instead. For this the other toys then throw Woody out of the window. From the big outdoor world, Buzz and Woody have to learn to work together to get back to Andy's house before Andy's family moves away. Their adventures take them to a themed eatery and to Andy's neighbor's house, where the older boy who lives there likes to play Dr. Frankenstein with toys. The combo pack has, on the regular Blu-ray, bonus features, ranging from deleted scenes to Buzz Takes Manhattan. But the best bonus feature is "Black Friday", what Toy Story almost was. It chronicles how the story was evolving after the Disney Company got involved in the project. Shortly thereafter the Disney executives asked the creators what happened to their story, and when they were told what happened, they understood that Pixar works best doing their own stuff without the major corporate involvement to fine-tune the story. This was Pixar's first full length major motion picture, and probably wouldn't have happened without the help of one of the executive producers, the late Steve Jobs. In addition to the bonus feature disc, the set also includes a DVD copy of the film and a digital copy. In all, an extremely good value for such a great film. Toy Story images © Walt Disney Pictures. All Rights Reserved.